Brought together by the Rocky Mountain Institute (RMI) to participate in an intensive, practical, 2-1/2 day problem-solving workshop, representatives from 35 US solar industry companies believe they have developed a new, much more efficient means of building out community-scale solar energy projects 1-10MW in scale. The new methodology could reduce the time required to complete construction from weeks to days, RMI CEO Jules Kortenhorst explained in an interview. The new solar project implementation methodology encompasses the assembly of prefabricated solar photovoltaic (PV) panels and other solar energy project components in small-scale facilities, ideally situated at strategic geographic points around the US so as to reduce time-to-delivery and transportation costs. All in all, RMI and workshop participants are confident they can reduce the all-in, installed cost of community-scale solar energy to US$0.50 per watt peak (Wp) in short order. 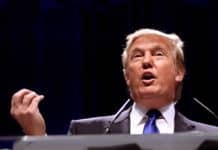 That would be enough to offset the new, punitive US import duties on Chinese-manufactured PV cells and modules/panels President Donald Trump announced Jan. 22, RMI highlights. 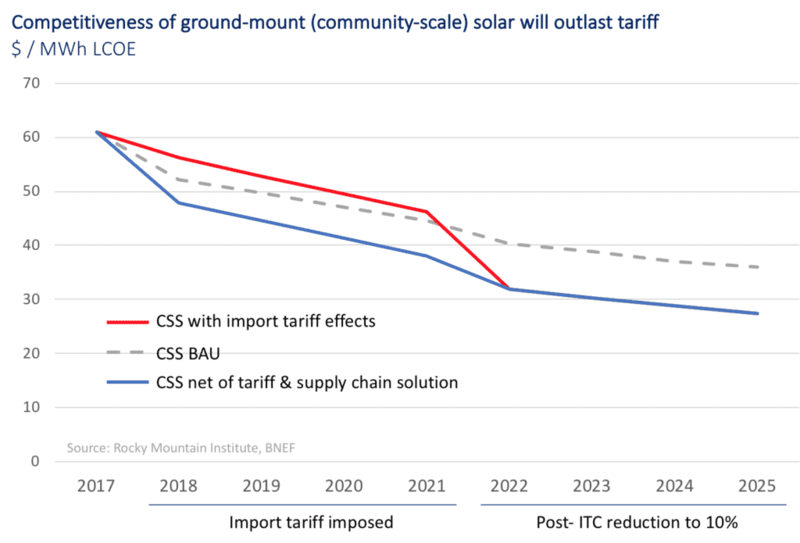 “We’ve calculated the new Chinese solar tariff will add around US$0.12 per watt to the installed cost of [community-scale] solar energy projects. Right now, project costs run somewhere between US$1.50-$2.00 per watt installed, so an additional US$0.12 per watt, though not insubstantial, should not be insurmountable,” Kortenhorst told Solar Magazine. The US solar industry has made tremendous progress when it comes to reducing the cost of deploying solar energy capacity, particularly at the utility scale, RMI’s CEO pointed out. “The industry has been able to get ahead of the curve, having achieved the national target set out by the [Dept. of Energy] SunShot Initiative well ahead of schedule. We expect the declining trend will continue, possibly even accelerate, and we expect to contribute to that, this latest industry workshop being just one example,” Kortenhorst said. The DOE launched the SunShot Initiative during President Barack Obama’s term in office. Broadly framed, the overarching goal is to bring the all-in cost of solar energy, from utility down to residential scales, to less than the cost of conventional utility electricity by 2020. 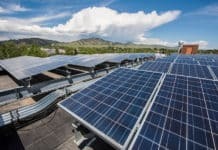 Industry participants have been able to realize the utillity-scale goal three years ahead of schedule, and they are fast closing in on the residential solar energy price target. 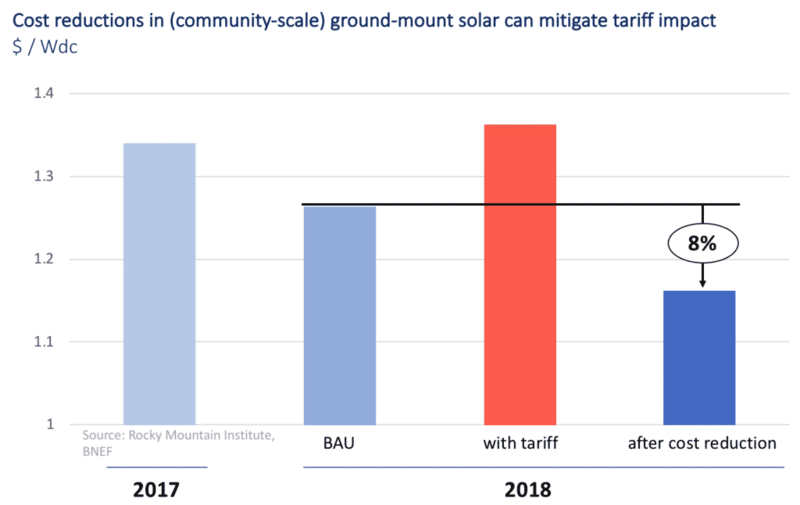 The cost of developing community solar projects has been declining in recent years to the point where it now represents a “sweet spot” in the US solar energy market, according to RMI. Focusing on reducing the cost of community solar energy makes a lot of sense in other respects. Building out solar energy capacity to serve entire communities should be much more efficient in terms of solar energy production, operations and maintenance than it is for residential, rooftop solar projects, or for commercial/industrial solar projects in some cases, for instance. Likewise, the costs of community solar project site acquisition, permitting, licensing and financing should also be lower. There are other benefits as well, Kortenhorst highlighted. “Community-scale solar has been an underdeveloped market segment. The emphasis has been on utility-scale and rooftop solar, but building out community-scale solar capacity in the 1-10MW range doesn’t require a lot land, a site about the size of a football field is sufficient, and we expect project development costs will continue to decline,” he explained. Furthermore, community-scale solar projects do not require spending as much on, or pose as many challenges, in terms of grid integration. In addition, “there are more opportunities when it comes to project development sites,” Kortenhorst pointed out. 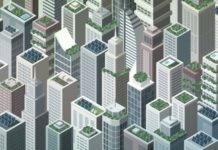 “Commercial and industrial end users, hospitals, schools, shopping centers – prospective sites are likely to be available in or nearby many communities. “The key advance is the development of a new, different conceptual framework, namely the assembly of much of an integrated solar panel solution in a highly automated, highly efficient plant that significantly reduces project cycle time, then rolling them out to sites on flatbed trucks,” he continued. With the identification of well-prepped sites, RMI and project workshop participants believe they can reduce on-site construction time by a whopping 75 percent. “All of a sudden, it becomes a much more efficient project,” Kortenhorst said during the interview. 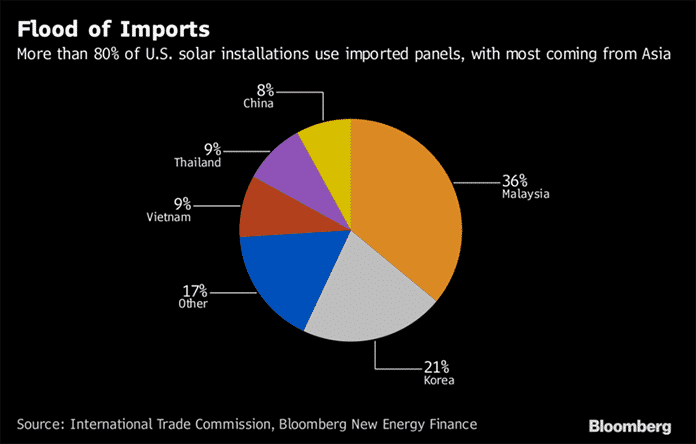 Starting off at 30 percent in the first of a four-year period, the new US tariff on imports of solar cells and panels manufactured by Chinese companies amounts to a 5-10 percent increase in overall project costs at the community scale of 1-10MW, according to RMI. “That’s relatively modest compared to ongoing declines in overall solar energy project development costs, which have been consistently running at an average of around 15-20 percent year over year for the last couple of years,” Kortenhorst noted. RMI and workshop participants believe they can reduce the cost of building out community-scale solar energy capacity by US$0.50 per watt by assembling prefabricated solar PV panels and incorporating other key system components in factories, then rolling them out fully assembled to project sites on flatbed trucks. Getting down to $0.50 per watt installed will take a bit of time, but we expect that even in the first round, this methodology will serve to drive total installed, community solar project costs from 1-10MW in capacity down an additional US$0.20 per watt. Following through to realize the envisaged reduction in community-scale solar energy costs, RMI has issued an industry-wide request for proposals (RFP) to construct an initial solar PV panel assembly plant. The Golden, Colorado-based non-profit renewable energy/energy efficiency development pioneer expects to choose a construction partner in six to eight weeks, Kortenhorst said. The idea behind this is that once the first plant is up and running successfully, we can transfer and employ the same method and technology in other parts of the US and around the world. As an NGO (non-governmental organization), we want to roll this out as quickly and as widely as possible. RMI and workshop participants estimate that it will cost less than US$4 million to complete construction of solar PV assembly plants with production capacity of some 70MW per year. “We expect adoption will increase once the first factory proves the concept,” Kortenhorst told Solar Magazine. Declining to divulge exact numbers, Kortenhorst did say that project participants expect the investment returns associated with building and operating the community solar energy assembly plants will be in the double-digits – attractive enough to attract strong interest. “We’re still fine-tuning the numbers, but we expect very solid, double-digit IRRs (internal rates of return),” he said.